Focus Mode is a new experimental feature of Google's Chrome web browser. Google added a Focus Mode flag to Chrome Canary in February 2019 but enabling it at that time did not do anything as the underlying functionality was not fully implemented back then. The description did not reveal much, as it simply stated that enabling the flag would allow users to switch to Focus Mode. Recent versions of Google Chrome Canary, the cutting edge development version of Google Chrome, support Focus Mode functionality. It is unclear whether the feature is fully implemented already or if it is only partially available. It is still necessary at this point to enable Focus Mode in Chrome before the feature becomes available. Note that you do need to run Chrome Canary at this point to test it. Make sure you run Google Chrome Canary and that the browser is up to date. Set the flag to Enabled. 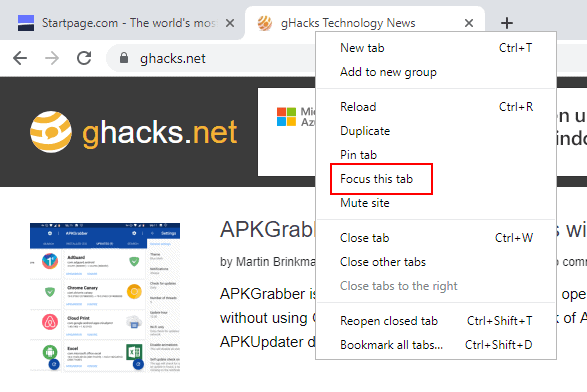 A right-click on a tab displays the new "Focus this tab" option after the restart. What it does? It loads the web page in a new browser window that lacks most interface elements. 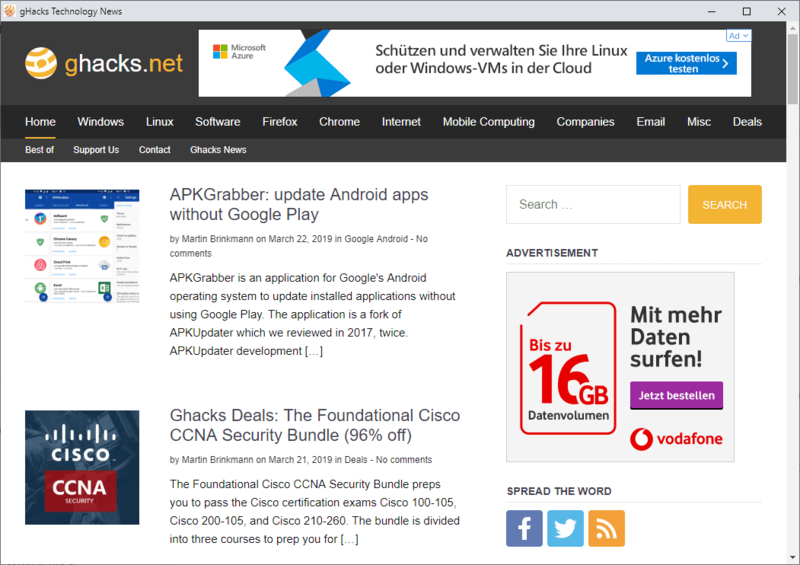 Only the title bar and scroll bars remain; all other interface elements, the address bar, extension icons, Chrome's menu, or bookmarks toolbar are hidden in that window. The window spawns with its own icon in the taskbar of the operating system, and the icon that it the site's favicon. A right-click on the title bar displays more options than usually. You find options to go back or forward, reload the page, zoom in or out, or search for content on the page. There is no option to bring the page displayed in the focus window back to the Chrome window it was launched from. Focus Mode displays a single web page in a headless window. Extensions continue to work in Focus Mode but you may get less control as you cannot interact with the extension icon while in that mode. There is also no (obvious) option to access the menu to make configuration changes, or switch to a different URL that is not linked on the page that is active. Focus Mode removes some distractions from Chrome and may display more content of a web page in the window due to the reduced browser interface. Whether that is sufficient for it to be used instead of fullscreen mode remains to be seen. It is possible that Focus Mode is still in active development and that additional functionality will be added to the mode in future builds. Now You: What is your take on Focus Mode? Focus Mode is a new experimental feature of Google's Chrome web browser that is now available in recent Google Chrome Canary builds. Looks to me it’s nothing more than an interface for the –app= command line switch. I understand that lots of people really like having as much of their browser hidden as possible. I am not one of those people. I prefer having the controls visible at all times. Looks like a kiosk mode, so you could set up a public terminal with limited access / interaction. I find it useful in certain situations, especially when user has desktop space (multi monitors) to spare. Paired with “keep window on top” option.